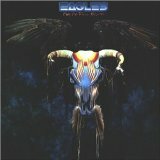 Dr. Rock's Blog & Roll: Album of the Day: Eagles (6/10/75) 35 Years! Album of the Day: Eagles (6/10/75) 35 Years! The Eagles were on a roll in early 1975. Their first three albums went multi-platinum, they’d issued four Top 30 hits, the last of which, “Best Of My Love” was still charting over a year after its parent album (On The Border) was released, and America (plus the rest of the world) was beginning to really dig their laid-back, light country-rock “L.A. Sound” (nevermind that none of the band members were actually from L.A). One Of These Nights (released June 10, 1975), the Eagles fourth studio LP, continued their soaring but also marked a turning point for the band. The album was dominated by the growing leadership of premier light country-rock songwriters Glen Frey and Don Henley and by the imminent departure of original member Bernie Leadon. Bernie was soon out (replaced by Joe Walsh), Don and Glen became de facto leaders, and within 18 months the Eagles achieved mega-stardom with the incomparable Hotel California. But in mid-75, One Of These Nights was the best of the pre-Hotel Eagles. It featured four enduring Eagles songs: the title track; “Take It To The Limit;” “Lyin’ Eyes;” and “After The Thrill Is Gone.” Deeper still is Bernie’s swan song, the spacey country-rocker “Journey Of The Sorcerer” and the curious “I Wish You Peace,” co-written by Bernie and Ronald Reagan’s renegade daughter Patti Davis. One Of These Nights also features soon-to-be-gone Randy Meisner, who sang lead on “Take It To The Limit” and is credited as co-writer on “Too Many Hands.” The Eagles were in transition on One Of These Nights, with the best to come. My Top 25 Eagles tunes are in the Playlist Vault and One Of These Nights is available as a CD or mp3 downloads on Amazon and as iPod downloads on iTunes.